Made from 100% Organic Pomegranates, it is pasteurised and vacuum sealed in glass bottles. Pomegranate is a nutritive and delicious, super fruit. This is an excellent source of natural anti-oxidant Vitamin C and essential micro-nutrients. Naturally healthy, our sweet Organic Pomegranate Concentrate makes a terrific ingredient for cooking, baking, salad dressings and cocktails. Pomegranates have: Essential Micro-Nutrients - Valuable Polyphenols and Anthocyanins Help Maintain Normal Cholesterol Levels and Support the Immune System Good Source of Potassium, Manganese, Folate and Vitamin K Natural Source Minerals Help Restore Body Electrolytes Helps Support Digestion for Overall Well being and Vitality Certified Organic by QCS - Florida Organic Growers and Consumers! No synthetically compounded fertilisers, pesticides, herbicides or growth regulators. 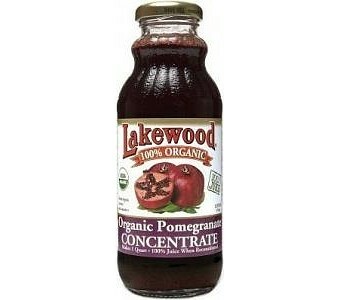 All Lakewood juices are pressed, bottled and vacuum sealed in Certified Organic Facilities. For the highest quality and to protect the natural fresh pressed characteristics, flavor and color; keep juices cool, refrigerate after opening. For best quality and freshness, use within two weeks of opening. Natural juice products will settle. Shake Well Before Serving.